Americans, we sure love our feel-good stories about living in a capitalist dystopia! The latest installment comes courtesy of Good Morning America, which reported on the “trend” of coworkers donating their (already paltry) paid time off to new parents who are desperate for paid family leave. Hughes did not qualify for any paid maternity leave because she was so new at her job. 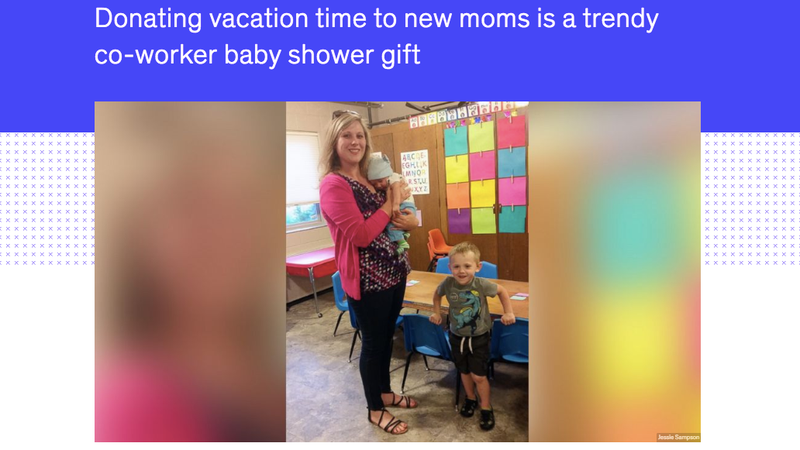 She said she never took a day off during her entire pregnancy so she could save as much vacation time as possible for after the baby was born. Her boss, sensing her stress, donated 80 hours of her own paid time off to Hughes through a policy at the college allowing the practice. More coworkers followed suit and, in the end, Hughes had eight weeks of paid maternity leave, almost all of which was donated by coworkers. Sampson, who is given 12 vacation days and 12 paid sick days per year by her employers and otherwise has no access to paid family leave, was similarly able to take time off using “donated” leave after she gave birth to her son. Their coworkers did an objectively nice and generous thing for them, which is to say, they collectively helped ease the suffering most of us experience living in a society that prioritizes productivity and profits over our basic human needs. But damn, can we stop mistaking human generosity in the face of structural deprivation for some kind of happy ending? I personally would prefer that we set fires on the lawns of Ivanka Trump and Paul Ryan until the United States catches up with the rest of the world when it comes to supporting new parents who are raising the next generation of workers destined to live under the thumbs of their bosses. Correction: A previous version of this post stated that Jessie Sampson only receives 12 days of paid leave every year. It has been updated to reflect that she receives 12 vacation days and 12 paid sick days per year.